A delicious Peach Slab Pie Recipe for using up those ripe peaches and an easier way for serving pie. You, like many a human on this earth, may have heard of the phrase ‘Georgia peach.’ We love the state of Georgia. Many of our friends and family members are from Georgia. It’s a lovely state for sure, full of lovely, lovely people. But, as a Carolina Girl, I would like to reclaim the peach for the equally lovely state of South Carolina. Because nothing could be finer than to be in Carolina in the morning … eating peaches. Did you know that the peach is the state fruit of South Carolina? And that South Carolina produces more peaches than Georgia, second in the U.S. only to California? And did you know that the South Carolina Peach Council is campaigning to dub SC ‘the tastier peach state’? Yep. Thems are the facts, Jack. No hard feelings Georgia. I love ya like you’re my own. But how about a friendly inter-state peach-off? What say you? Who’s up for the tasty challenge? Let’s do it! All this to say, the peach is truly a beautiful, sweet, downright scrumptious fruit, most worthy of a few states vying to claim it as their very own. So wherever you happen to be, hunt down some ripe peaches while they are in season. Fresh ripe peaches are remarkable when in season. 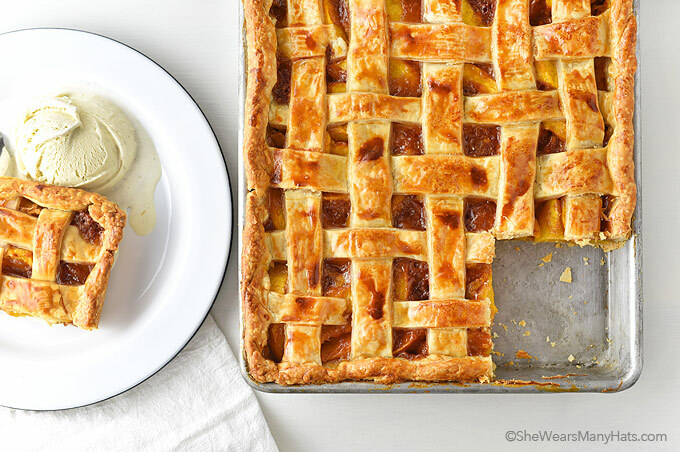 If you are able to get your hands on some, whip up this easy Peach Slab Pie. It’s the perfect place for fresh peaches and oh so easy to make. 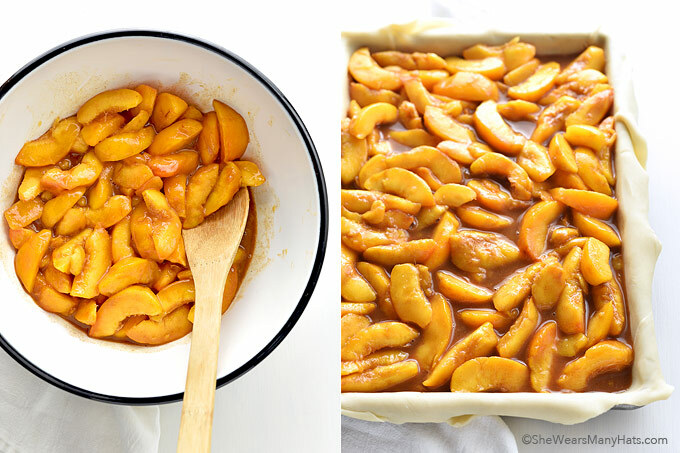 This Peach Slab Pie is basic pie prep only in baking sheet size which makes it super easy for serving a crowd and equally as tasty as the standard round version. 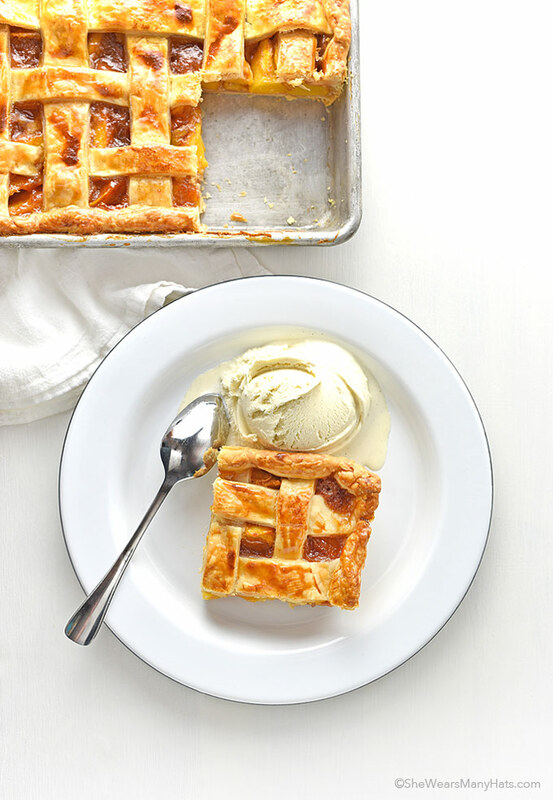 The peach pie filling is straight forward pie fixing. Quick prep, y’all. As far as the crust, this slab pie recipe requires the equivalent dough of two pies, with a top and bottom crust. Use homemade pie dough or purchase pre-made dough. Whatever works for you! 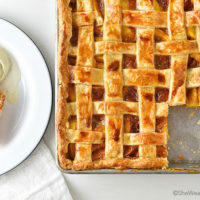 This delicious homemade Peach Slab Pie Recipe, made with fresh peaches, is perfect for serving a group and is easy make too! *Amount of dough is comparable to 4 individual single pie crusts. I recommend Ina Garten’s pie dough recipe, doubled for this slab pie. Store-bought pre-prepared dough may be used. Roll out and shape to appropriate size. 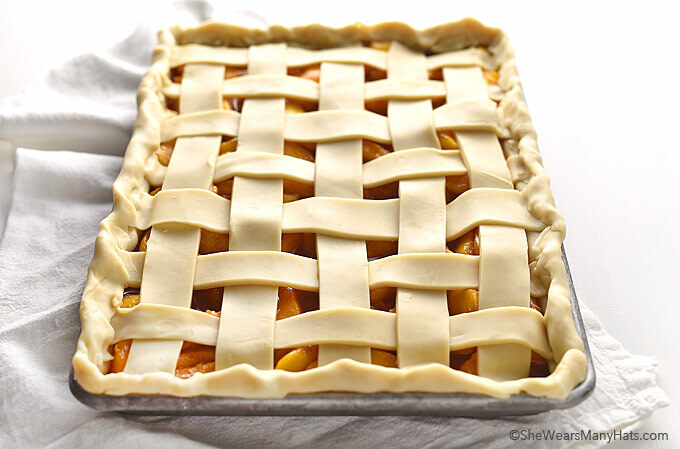 **If desired, strips may be cut and interwoven to create a lattice top, or cut out decorative shapes in top crust before topping pie. Happy 4th weekend. Just want you to know how much I enjoy you blog site. I’ve been coming here since 2011. Please keep doing what you do so well. I was wondering if you peel the peaches as well. Do you think this would work with canned peaches/drained? I’m also wondering this. If you try it, I’d like to know how it turns out. ???? I’m not sure what the results would be as canned peaches are already poached/cooked. I imagine the peaches would be more mushy. Palisade Peaches from Colorado are pretty dang good too! This looks like a great recipe. Is there a way to make this in a 13×9 cake pan? 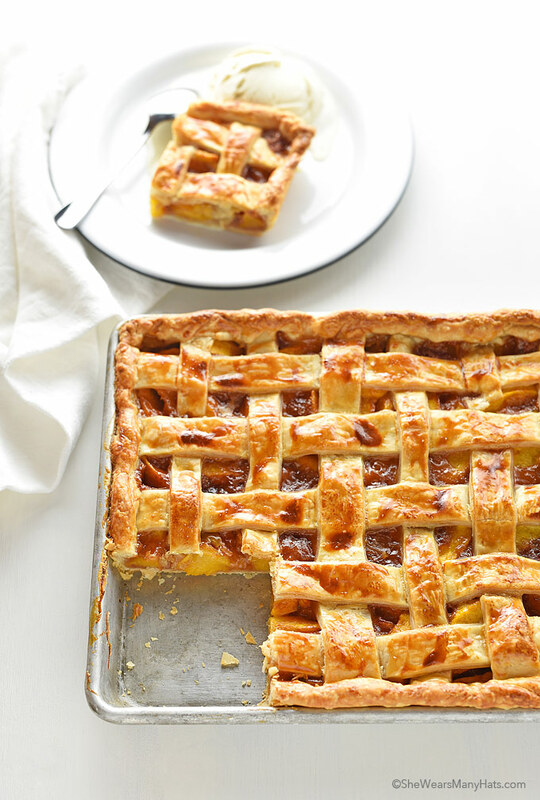 Yes, you will just need to roll down the edges of pie crust to make fit to your liking. That’s what the recipe says to use! Can I use can peaches the 16oz? If so how many? I was wondering about freezing this pie, how long can you freeze it for after making it? I would let it cool to room temperature and then wrap tightly before freezing. I made this for my Herb Club Harvest Dinner (by adding one tablespoon of finely minced basil), and it was the first dessert to be completely devoured. 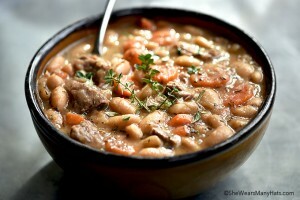 In fact, I barely got to taste it & now have to make another for hubby & me! 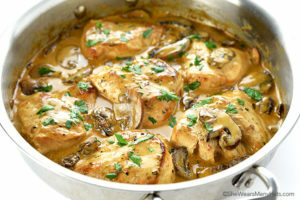 Delicious – and so easy! Oh, I can’t wait to try it with basil, Donna. What a great addition. Hello Amy. New to site. Here in Texas this is a Peach cobbler. Can’t wait until summer for our peach season to make this unless I can make it with frozen peaches. What do you think? Looks easy and yummy. Thanks. Thawed frozen peaches should work well. What kind of Peach works best for recipes? There are many different kinds of Peaches. Does it matter which kind I use? 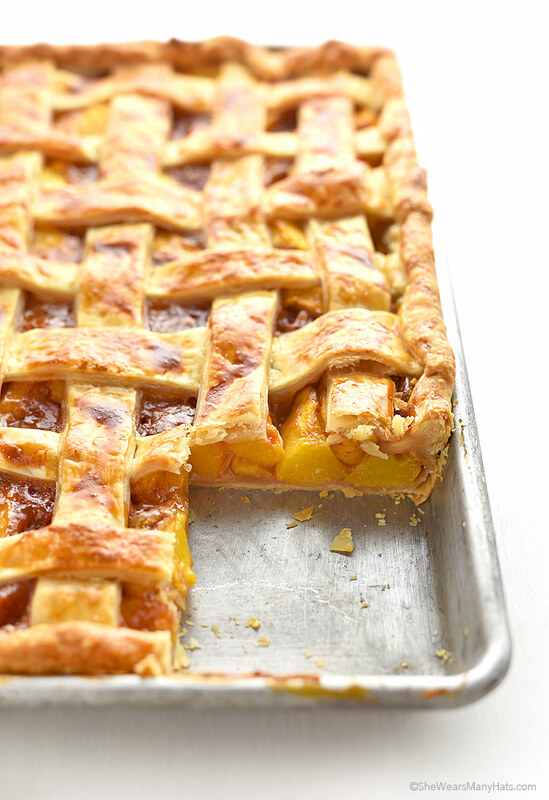 Does the bottom crust not get too wet from the peach juice mixed with sugar, etc?